Holy midseason finale, y’all! Station 19 continued the jaw-dropping tradition of TGIT shows ending the first half of their seasons on massive cliffhangers that leave us on the edge of our seats until the shows return in 2019. The Grey’s Anatomy spin-off ended Thursday’s episode with both Andy (Jaina Lee Ortiz) and Sullivan (Boris Kodjoe) in serious jeopardy. Andy and her new captain were trapped in the aid car together for most of the episode’s intense windstorm and were stuck after picking up a victim of a hit and run left in the same spot where Sullivan’s wife died years before. As the two waited for dispatch to tell them what hospital was ready to take them and their victim, the aid car started to get blown away. With dispatch not answering, they decided to make a go for it blind, but the episode ended with the image of the aid car turned over a deep ravine and neither Andy or Sullivan visible in the wreckage. Back at the station, everyone was enjoying Friendsgiving but emotions were mixed there as well. 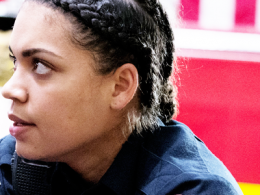 Maya (Danielle Savre) got her well-deserved promotion to lieutenant, but it means heading to another fire station, which has her feeling a lot of different ways. Elsewhere, Jack’s (Grey Damon) PTSD from the skyscraper fire at the end of Season 1 is manifesting in aggressive and dangerous ways. 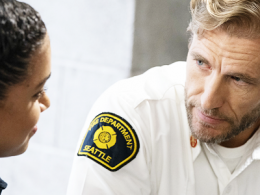 Meanwhile, Vic (Barrett Doss) and Ripley’s (Brett Tucker) affair blossomed to new depths, which will create a very murky situation in the second half of the season. 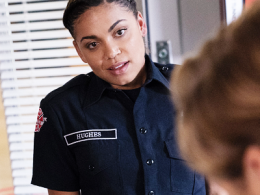 TV Guide talked to Station 19 showrunner Stacy McKee about what that cliffhanger means for the crew and what’s next for our A-shift firefighters. This midseason finale was sort of a crossover event with Grey’s Anatomy. Considering how much drama’s happening in the cliffhanger, will the winter premiere also pick up with a crossover? Some people need some medical attention. Stacy McKee: Yeah, it’s very possible that some medical attention will be needed. … I don’t think it will have that much of a crossover element in that way, but it will be a direct pick-up. Ripley and Vic are really blossoming into something, but he’s a little bit concerned about his position of authority over her. How are you going to explore that going forward and deal with that delicate balance? McKee: It’s definitely a delicate balance. Both professionally, and I think emotionally, for the two of them. We’ve established that Ripley has had a number of romantic relationships prior. We said he’s been married before and we’ve never really played that Vic has ever had a really deep, sort of moving relationship. It feels like the two of them really have such a sort of undeniable connection, which is sort of — it’s like magnets, you know? They’re so attracted to one another, and they just keep finding themselves pulled toward one another. So we want to explore all the facets of that. I feel like that’s a really exciting romance for us to see moving forward. Even though we’re only halfway through this season, you made a much more conscious effort to crossover with Grey’s more, even if it’s just events crossing over rather than people. How has that helped you expand this universe in Season 2? McKee: Yeah, it’s been really fun to play with things like that, you know? Because, I mean, we have it as part of the show that the hospital is just a few blocks away from the fire station. So for instance, with the finale, just the idea of being able to have a unifying event that’s affecting the city of Seattle, and would of course affect the hospital in one way and affect Station 19 in another way, to me those are the sort of, I mean I’m such a fan first, that that’s the kind of fan candy I love. So anywhere we can, and we will do it. Because to me that’s just, it just enriches and widens the universe. I think it’s so much fun. What are you most excited for fans to get to see in the second half of the season? McKee: Oh my gosh, there’s so much! And there’s so much I can’t tell you. We are gonna have some more secret romances. We’re gonna have some pretty amazing affairs, some of them perhaps ill-advised. There are gonna be some incredible incidents with such major heroics, I just, I’m bursting because they’re gonna be so neat and cool. You know, there’ll be some pretty unexpected things too. Who knows? There could be a proposal, there could be, someone might die. You know? We’re gonna take big swings. It’s gonna be juicy. Can someone die in an even numbered season? That goes against the pattern. McKee: Listen, nobody died Season 1. We’re basically still in Season 1. This is Shondaland — you know how that works. Station 19 will return in 2019 on ABC.